Robotic Automation is a provider of robotics and the Australian supplier of FMC Technologies’ Automatic Guided Vehicles (AGV). Several of FMC Technologies' standard range of Forked, Unit-load and Towing vehicles is used in the food industry. 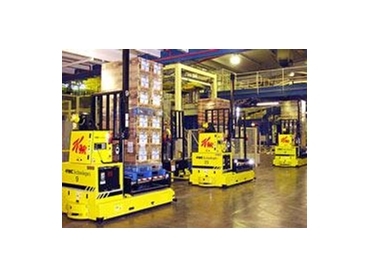 A popular application is the block-stack warehousing of product, where the AGV system interfaces with a Warehouse Management System (WMS) to direct each AGV to organise storage of palleted products according to type and access requirements. The WMS then also directs the AGVs to pick pallet orders and deliver them to despatch areas or even directly onto truck trailers. One specialty application vehicle that is also quite common is used for loading of food and/or trays into sterilisers. The Automated Batch Retort vehicle is specially designed for the application. It is equipped with gasketed stainless steel body panels giving the vehicle a wash-down capability. Hidden underneath the conveyor deck, the chassis features a drain pan with a remote drain valve to keep the vehicle and floor clean in case of a messy load. More features include zinc plated casters, splash proof motors, and splash proof external buttons and switches. A clear, flexible membrane covers the operator’s panel for waterproofing. The vehicle also performs perfectly well on wet or dry floors. Other FMC Technologies vehicles are well suited to perform general material handling operations within the food industry including raw material storage, raw material transportation, finished goods storage and finished goods transportation to the shipping area. These vehicles include Outrigger, Reach, Counterbalance, Tug/Tow, Conveyor Deck, Lift Deck, and Narrow Aisle.